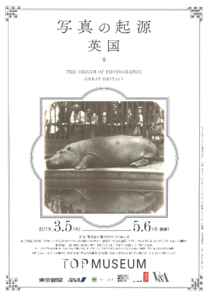 Tokyo Photographic Art Museum, which fills the role of Japan’s main photographic culture center, holds an exhibition every spring focusing on early photographs and this year, 2019, it will present ‘The Origin of Photography: Great Britain’ exhibition. Research into methods of photography began in the latter part of the 18th century, and with the announcement of the invention of the first photographic technology in 1839, the curtain was raised on photographic culture. In Great Britain, research developed by the members of the Victorian aristocracy was to have a broad influence on culture. In this exhibition we will present numerous works, many of them for the first time in Japan, to show the varied developments in photographic culture that took place in Great Britain but which remain largely unknown in Japan. In addition, it will also allow visitors a rare view of Great Britain during the 19th century, captured through contemporary photographs. We hope that you will come and see the broad range of Great Britain’s photographic culture and history that served as an inspiration to the Japanese during the latter half of the 19th century. A lecture by the leading expert on early British photography, Professor Larry Schaaf. Speaker: Prof. Larry J. SCHAAF [Director of the William Henry Fox Talbot Catalogue Raisonné] ＊with simultaneous interpretation. ＊Numbered tickets will be distributed at the 1F Information desk from 10 am on the day. As a special service for this exhibition, there will be two guided tours of the gallery conducted in English. The lecturer is Sebastian Dobson, a researcher in photographic history, who will provide explanation in English while guiding visitors through the exhibition for about an hour. Free with purchase of regular exhibition admission. Venue: 1st Floor Studio, Tokyo Photographic Art Museum. Participants: 50 [first-come basis]. Entry: free. A demonstration allowing participants to watch the process of producing a calotype negative [paper-based negative]. This offers the ideal opportunity to learn the technique of producing the world’s first negative/positive photograph process. ＊After the presentation is complete, applications can be made for a ‘Calotype Production Workshop’ that will be held on April 6 [Sat.] and 7 [Sun.] For further details please refer to the museum’s website [participation charge payable, open only to those who attended the initial demonstration]. The curator in charge of the exhibition will give an explanation of the exhibits between 14:00 and 15:00 on the dates listed below. Participants should gather at the entrance to the 3rd floor gallery with an entrance ticket stamped for that day. Lectures on early British photography to be given in Japanese by researchers. Entry to this exhibition will include a discount for the ‘Parabola of Pre-Raphaelitism’ [Mitsubishi Ichigokan Museum] and vice versa for the duration of both exhibitions.